The Remix XP 10 is unavailable in this color. Pick another color to get on the water faster or join the wait list. It is often said that there is gap in kayak design, that no 'one' kayak excels in whitewater yet carries speed across flat calm lakes and slow moving rivers' that is until now. The Remix XP was designed to bridge the gap between the two once and for all. The Remix XP is an extension of our popular river runner series and although its roots are firmly planted in whitewater the XP's extended waterline allows it to cruise the flats with ease. The XP has an integral skeg which when deployed offers superb tracking but with the skeg tucked away the XP offers the agility needed to excel on whitewater. How did we do it? This first challenge was to make it whitewater friendly for everyone taking special notice to beginners looking at venturing out for the first time and for intermediate and expert paddlers desiring to camp out of their kayak. By adding additional width to the hull we achieved the stability we wanted even when loaded to the gills with camping gear. The next challenge was speed and tracking for the folks that would use it primarily on lakes and calm rivers and as we all know whitewater boats just don't want to go straight on flatwater and will tend to veer right or left. Speed was achieved by extending the length and waterline of the XP and by dropping the rocker profile slightly which allows it to really cut through the flats. Now we had to fix that nagging veer, by adding a spring loaded skeg (don't worry the spring is made from stainless steel) to the stern that annoying veer was immediately gone for good and paddling across vast sections of flatwater became a no brainer. Camping? There is nothing more satisfying than doing a self-support camping trip out of a kayak. It's like backpacking except that the boat is doing the back breaking hauling part. Most whitewater kayaks are hard to camp out of. Stuffing gear and dry bags behind the seat is a pain then tugging and pulling everything out at night can be another nightmare but the XP eliminates the pushing and tugging of gear by offering a dry storage compartment that is easily accessed through its large 'backcess' hatch. Easy on and off the backcess hatch is stiff, lightweight and dry. The storage compartment can easily hold a weeks worth of camping gear. 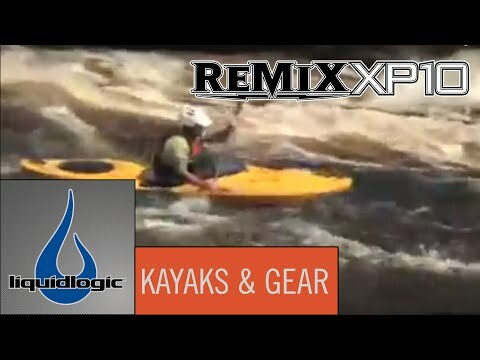 Summary: If you're looking for an all around go anywhere kayak that is comfortable, safe and easy to paddle look no further than the Remix XP. We spared no expense in designing this true 'Crossover' kayak so that you can have the time of your life. The seat itself does not adjust back and forth. The backband adjust as well as the foot pegs and thigh braces to get the perfect fit for you. The boat also comes with hip pads with shims to give you a comfortable fit at the hips.